Number of knives max. 35 pcs. 35 pcs. 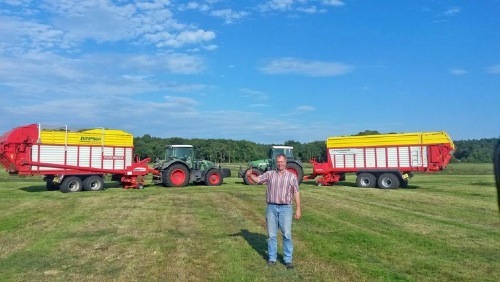 Low drawbar, 3.0 t drawbar load for EUROPROFI 5010 and 5510 as an option. A folding parking stand makes it easy to attach and detach. Optional automatic high and low drawbar transport and loading positions (with POWER CONTROL). Tailgate opening angle adjusted as required from the tractor seat. Access ladder and side door standard on D models, optional on L models. The driveline is designed for high outputs. 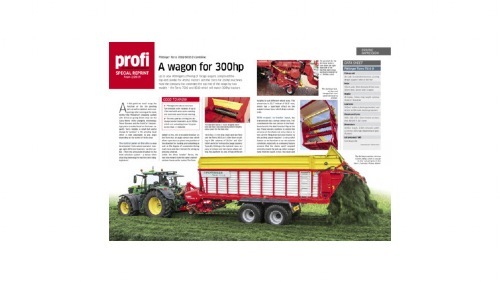 EUROPROFI silage wagons are designed for tractors up to 220 hp. 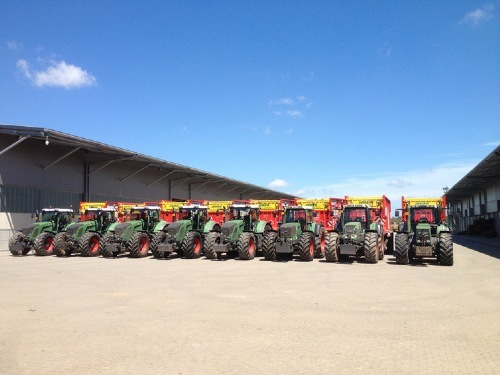 They are driven by a wide-angle PTO shaft and a cam-type clutch to protect the driveline. The large-dimensioned rotor transmission is submerged in grease. 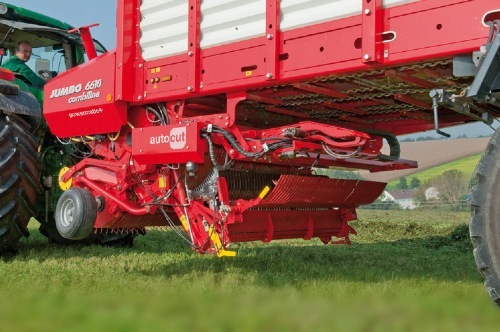 The driveline is protected at 1800 Nm, corresponding to a peak tractor power of 162 kW / 220 hp. This represents an increase in performance of 20 %. A strong hydraulic motor provides the drive. The speed can be easily controlled. The scraper floor is also available with a two-stage motor (standard on 5510). Pick-up switches off automatically on EUROPROFI D models while unloading with beaters. 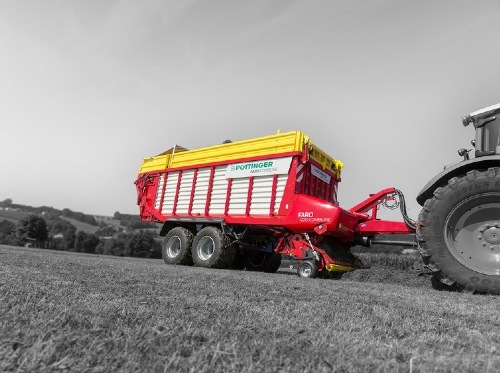 An optimised wind guard with swath roller ensures perfect forage flow with every type of crop, even at high loading speed. The pickup is controlled from both ends by a steel cam track. The sealed twin-race roller bearings on the cam rollers are designed to withstand high stresses. The pick-up tines are controlled in a sweeping arc. This results in optimum protection of the sward, lower levels of soil contamination and prevents unnecessary wear to the tines. Thanks to lower speed and controlled tine movement. The tines are slightly trailed to sweep in a controlled arc and adapt ideally to ground contours. 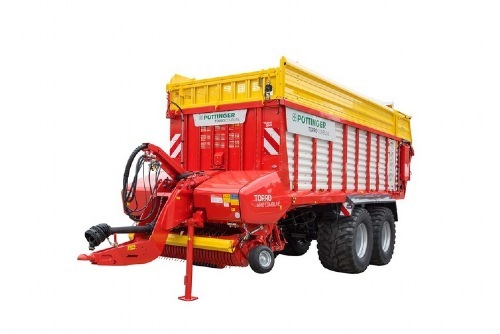 To the rotor in all conditions, fully active tine length up to withdrawal point. 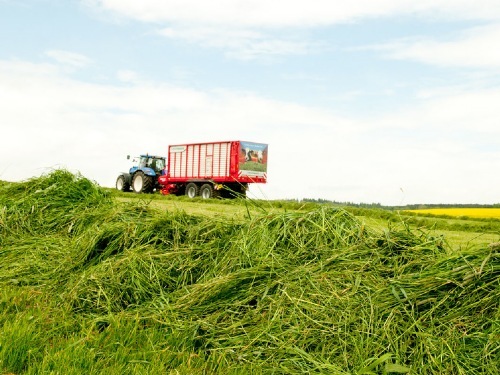 Because forage is not 'combed through'; less longitudinal alignment of stalks. The two main bearings have a lubrication interval of 80 loads and are easily accessible from the outside. EUROMATIC PLUS is the heart of EUROPROFI loader wagon series. 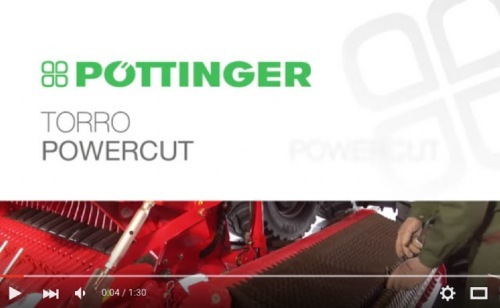 Rugged and powerful, the rotor delivers high output chopping and compression. 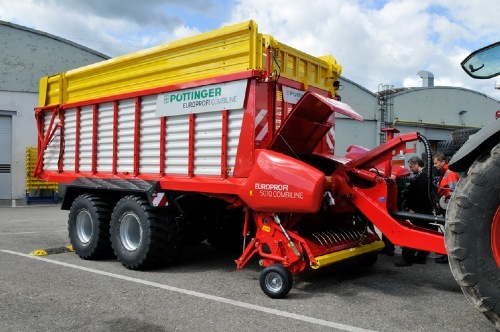 EUROMATIC PLUS stands for smooth, power-saving penetration of the crop and perfect transfer from the pick-up. 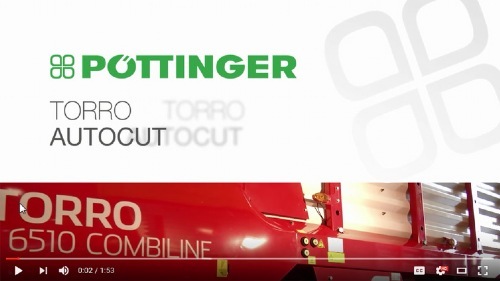 The conveyor tines made from hardened Durostat 500 fine-grained steel ensure maximum performance even with wet and short forage. The optimised tine shape and large scraper surface ensure the best possible compression in the loading chamber. The tine rings are hooked into the central drum and welded around the circumference for exact positioning. The scrapers have an 25 mm wide rear face and are individually mounted and bolted. They ensure highest possible compression, depending on how the automatic loading system is set. Press the central knife release button to disengage the knives so they can easily be removed without tools. The newly-developed and patented geometry of the reversible TWIN BLADE knife provides double the service life. A continuous perfect chop is ensured while replacement knives are always on-board. The forage is chopped right through exactly and uniformly. 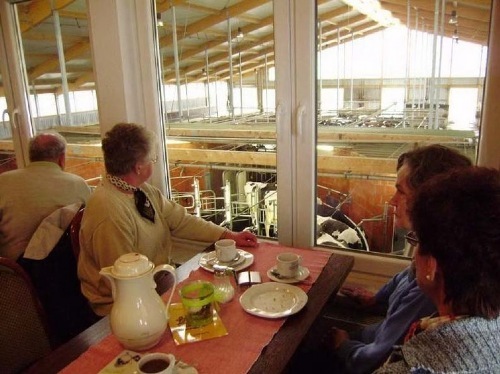 The chopped material is ideally structured for ruminants. An optimum gap between the knives and tines ensures smooth operation and protects the knives from foreign objects. The trigger roll is lifted out of its holder at the back of the knife. The knife is automatically brought back into the starting position. 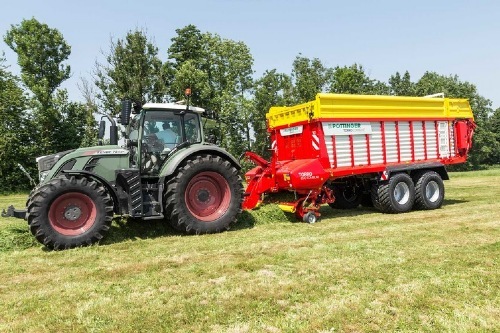 The forage compression flap can be equipped with an optional hydraulic cylinder to enable a rapid change between loading and combined mode, controlled from the tractor seat. 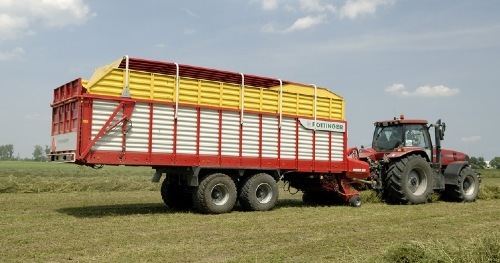 All EUROPROFI COMBILINE wagons are fitted with slanting mudguards and closed frame beams. Nothing is left lying on the mudguards. No crop falls onto the road during transport. The steel profile panels are fully enclosed, right to the top. The profiled plates have a special coating to guarantee a long service life. No extension bars needed because the side walls extend above the level of the forage compression flap. The large surface area of the forage compression flap ensures best compression of the crop and maximum use of the loading chamber. Roof ropes with rear tarpaulin for crop material with a low density. LED floodlights on front panel and mudguards. LED floodlight package (loading chamber, tailgate, pick-up, knife bank) only with POWER CONTROL or ISOBUS. The automatic loading system guarantees that the wagon is filled to achieve maximum transport capacity. The forage is already carefully compressed in the transfer duct to make full use of the loading chamber. A press of a button on the terminal is all that is needed and the full cross section of the tailgate opens to unload EUROPROFI L models in a few minutes. The automatic unloading system makes life easier for the driver and protects the machine. The scraper floor has been lowered at the front by 150 mm to accommodate tyres up to 710/45 R 22,5. 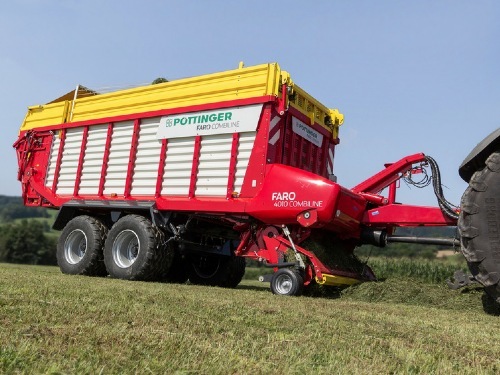 The forage is conveyed upwards to the rear for uniform and smooth discharge. Perfect unloading with a low power requirement. Powerful drive chains ensure rapid unloading. A two-stage motor is available as an option for unloading speeds of up to 18 metres/min. 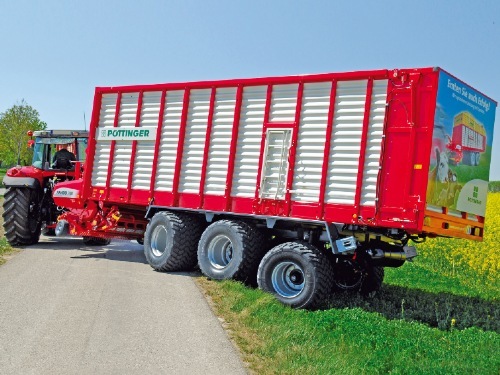 Increasing load volumes and high transport speeds necessitate a robust chassis that protects the ground. 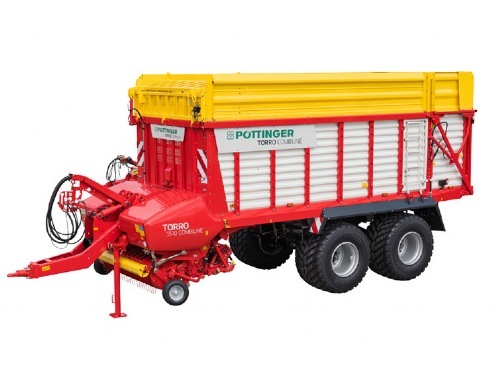 PÖTTINGER has invested a great deal in this issue. 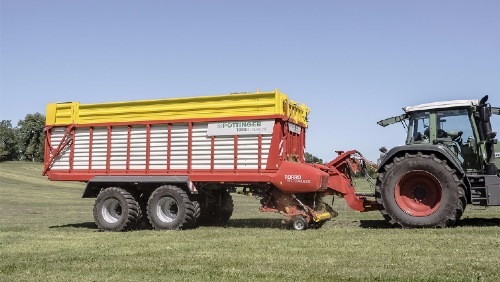 High quality tandem axles with tyres that provide a large surface area of ground contact are the answer. Wide spring spacing of 1100 mm at front. 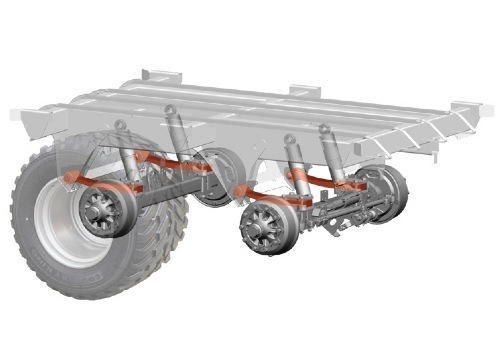 Strong trailing linkages apply the braking and steering force on BPW axles. BPW axles up to 18 t with 410 x120 mm brake pads for powerful braking at high transport speeds. 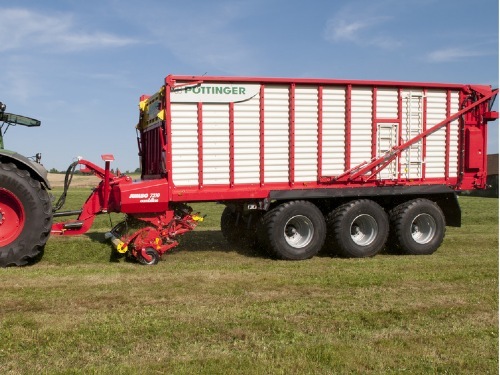 Trailing steered axle protects the sward even with heavy loads. Tandem axles with hydro-pneumatic suspension and steered axle, optional, 16 t axle load, 22.5".